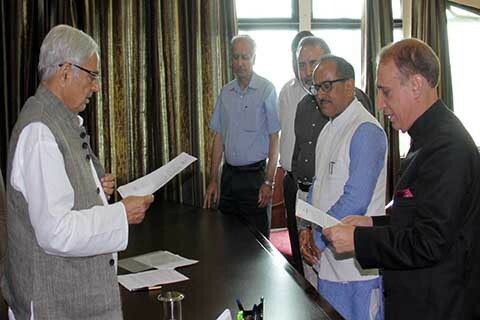 SRINAGAR, JULY 28, 2015 – Chief Minister, Mufti Mohammad Sayeed, administered the oath to Abdul Latief Deva as Chairman of J&K Public Service Commission (PSC) at Civil Secretariat, here today. Deputy Chief Minister, Dr. Nirmal Singh, Chief Secretary, Iqbal Khanday, Principal Secretary to Chief Minister, B. B. Vyas and Secretary, GAD, Gazzanfar Hussain, were present at a low-key affair, in view of the sad demise of former President of India and Bharat Ratna, Dr. APJ Abdul Kalam, yesterday. Immediately after the oath-taking function, the Chief Minister expressed hope and optimism that the newly-constituted PSC will fast-track process of recruitments. An IAS officer of 2001 batch, Deva was born in Anantnag on 21st December, 1956. He has had an impeccable record as an officer having served at several senior positions in the administration including as Deputy Commissioner, District Development Commissioner, Municipal Commissioner, Settlement Commissioner, Custodian General and Vice Chairman of J&K Lakes & Waterways Development Authority. Given his vast experience in administrative matters, Deva played a key role in policy-related issues and bringing in greater synergy in the field between the officers and general public. After taking over reins of power, the present Government had initiated process for filling up vacancies in J&K PSC after the Constitutional body had become defunct last year. After assuming charge as Chairman, Deva administered oath to the other Members of the Commission which include Tashi Dorjee, Lal Chand, Jaipal Singh, Ali Asgar Choudhary, Prof (Dr.) Posh Charak, Prof Mushtaq Ahmad Wani, Mushtaq Ahmed Lone and Suresh Kumar Sharma.